Executive tote bag purses are the smart, chic choice for the polished professional or busy woman on the go. For a hectic day spent navigating from the office to meetings to errand runs, nothing comes in quite as handy or reliable as a bag designed to see you through it all in functional, fashionable style. 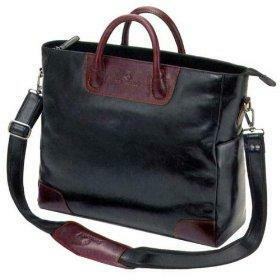 Despite its name, an executive tote is not necessarily solely for professional women. Indeed, a tote bag as smartly constructed as this can be a lifesaver for any woman who has a busy schedule. Executive totes are filled with functional details that make juggling tons of daily essentials a breeze. A regular tote bag, on the other hand, is unlikely to be laden with many (if any) pockets and compartments. Simply put, an executive tote is designed for the woman who requires an organized space for her necessities. Executive totes are distinctive in appearance, too. These aren't your everyday, grab-and-go canvas totes designed to be worn with jeans and T-shirts. Executive totes are usually made with leather (faux or real). Many tend to resemble spacious north-south handbags (or those that stretch from one end to the other and offer plenty of room within). They usually also boast visible but minimal exterior details, such as zippers, buckles, locks or, occasionally, more fashion-forward elements, like studs or tassels. More important is the bag's functionality. A truly useful executive tote will have at least two roomy interior compartments. Professionals may require a bag that accommodates a laptop, so be sure to check its measurements if this is the case. Other details to look for include exterior pockets (either with or without a zipper), cell phone compartments, zippered interior pockets and pen holders. Given that the majority of executive tote bag purses are quite simple in appearance, it shouldn't be difficult to find one that is suitable for a professional environment or for everyday use. Keep your office dress code in mind; if you're required to adhere to a very strict policy, stick with straightforward, timeless designs that will move easily from work to after hours, year after year. If you're shopping for a tote that's suitable for personal use or that doesn't necessarily need to meet the most stringent dress code requirements, then consider a bag with a few eye-catching details. The aforementioned studs are not quite as bold and outrageous as one might think, and they can add an intriguing visual element to an otherwise simple bag. Gold studs, in particular, look quite smart against a chocolate or black background. Hefty hardware is another type of detail that some designers tend to utilize on executive bags. Designer Marc Jacobs is known for his rich, bold push-locks and buckles, while other labels may dangle logo charms from zipper pulls. Against a neutral background, these types of elements can really stand out and add some personality to an otherwise very basic bag. When it comes to color, executive bags are generally of the same ilk. Variations of black, brown and camel are common, but red is a bolder shade that is quite often seen in workplaces. Red serves as the "anti-neutral" neutral hue; it's a shade that pairs well with almost anything, adds a pop to a sedate ensemble and generally livens up an entire look. Coach is a great choice if you're looking for something more in line with current trends. There are plenty of sizes and variations to choose from, and if you prefer something other than a neutral, you'll definitely find it at Coach. Dillard's is a great place to scope out designer executive bags from the likes of Lodis and Fossil. These sleek bags move nicely from the office to after hours. Overstock.com carries an impressive range of professional tote bags by a variety of designers. Check back often, as stock changes frequently.